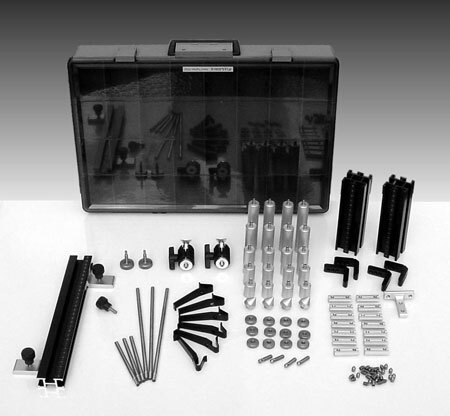 The FixLogix metric component kit for smaller CMMs and parts is simple, highly functional, and economical. Multi-axis infinite adjustment allows you to put locators and clamps where you need them. A wide variety of components such as vertical towers and swivel-heads are provided to improve setup flexibility. This kit configuration is vastly superior to other systems that cost twice the price. Additional components and accessories are available, and may be found on our website. (2) #MCLR150: 150mm vertical linear riser, laser engraved, w/ six t-slots: 2 x 2 + 1 x 1.